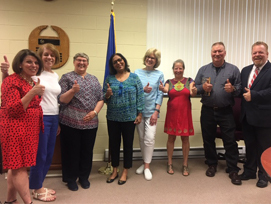 The Human Resources Department of the Ridgefield Public Schools is committed to recruiting, hiring, and supporting the most dedicated and qualified employees. Our employees must be able to educate all students to their highest level of academic potential as well as teach them the skills and knowledge to become capable, creative, and responsible citizens. Located 55 miles northeast of New York City and 50 miles from Hartford, Ridgefield was voted “The Best Town in Connecticut” by Connecticut Magazine. We invite you to learn more about our great community and school district. If you are a highly qualified, dedicated, and enthusiastic person, we'd love to talk about our employment opportunities and the other benefits you will find when you work at RPS. We offer our employees a competitive benefits package. We will provide information regarding benefits during the hiring process. Current employees may contact our carriers directly with questions or concerns regarding benefits. Karen M. Dewing, Title IX Coordinator, 70 Prospect Street, Ridgefield, CT 06877, (203) 894.5550. We’re here to help you find the information you’re looking for. Please meet our dedicated staff. To become a substitute teacher, paraeducator, or secretary, you must complete our online application. Please access the vacancies list and application by clicking on the appropriate link. We will call in applicants for an interview when we have openings. Substitute teachers must show proof of at least a bachelor degree.